Tech4Learning has released Common Core Curriculum Guides for Pixie to help K-5 educators align creativity, their curriculum, and the Common Core Standards. 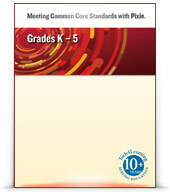 Tech4Learning Releases Correlations to Common Core for Pixie 3! Tech4Learning has released correlations to the Common Core Standards for K-5 Language Arts and Mathematics for its award-winning elementary software tool Pixie. These correlations will help teachers and administrators deploy Pixie to achieve the student learning goals outlined in the new Common Core Standards.